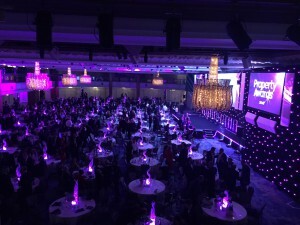 The property industry’s finest gathered together last night at Grosvenor House on Park Lane for the 2018 Property Awards. As part of the award’s 23rd year, the first ever winner of the new Irvine Seller Award was announced as Chief Executive of the Canary Wharf Group, Sir George Iacobescu. Helical’s Chair Mike Slade and the Crown Estates’ Alison Nimmo were also welcomed into the Hall of Fame. NovaLoca were proud to sponsor the Office Agency Team of the Year category. We are excited to announce that the winner was JLL! Our Managing Director, Miranda Munn, presented the winners with their award. Congratulations! We also sponsored last year’s ceremony – you can read all about it here.